It is a known fact that motor vehicle crashes are the leading cause of death among young children due in part to the non-use or improper use of child safety seats and seat belts. For this reason, it is our goal to work with parents and caregivers to teach them h ow to properly install a child safety seat into their vehicle. What is more, our service is FREE of charge! For your convenience, we have two locations with highly trained and certified car seat technicians ready to assist you 7 days a week from 8 am – 8 pm. An appointment is not necessary; however, we do ask that you give the station a courtesy call approximately 15 minutes prior to your arrival to make sure our on-duty car seat technician is available. 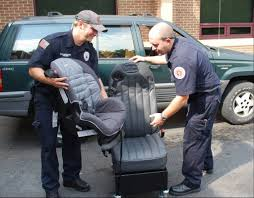 Although Countryside Fire Protection District offers free car seat inspections and instruction as a community service, the ultimate responsibility for the child’s safety rests with the parent or driver of the vehicle. For more car seat information visit the following sites: Buckle Up Illinois or National Highway Traffic Safety Administration Safercar Parents Central. Should you have any additional questions, please feel free to contact our office at (847) 367-5511 and ask to speak to a car seat technician.